Q: What is so special about the Badger Garden Gloves? A: Here are just a few of the features that sets it apart for the norm. 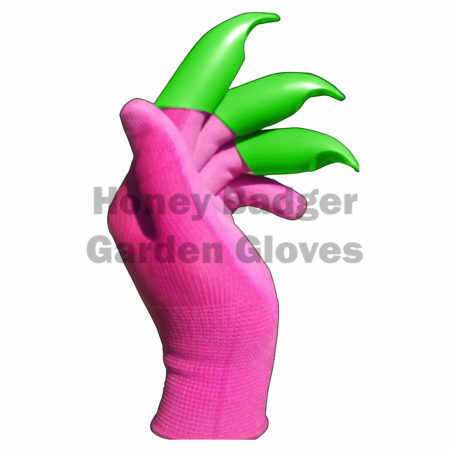 1/ The Badger Garden Glove solves the age old problem (# 1 complaint of glove users) that the fingertips wear out easily on regular gloves. The claws are designed & tested for over 200 hrs. of average gardening use (compared to 10 to 15 hrs. for the best selling regular glove to wear through). 3/ Superior protection. Can’t cut these with a pruner. Q: How does the Badger Glove protect my fingertips? A: The Badger Garden Glove uses several USPTO Patent Pending technologies. 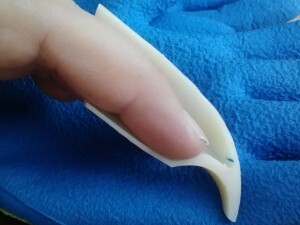 One of which is the ” ISOLATION POCKET ”which prevents the fingernail from being stressed during use. Q: What is “Leverage Technology” ? A: Leverage technology is synonymous with ” EASE of USE ” technology in that it enables you to use the stronger part of your hands instead of your fingertips to do the digging. Q: Can the Badger Garden Glove really replace the shovel or trowel? A: No. 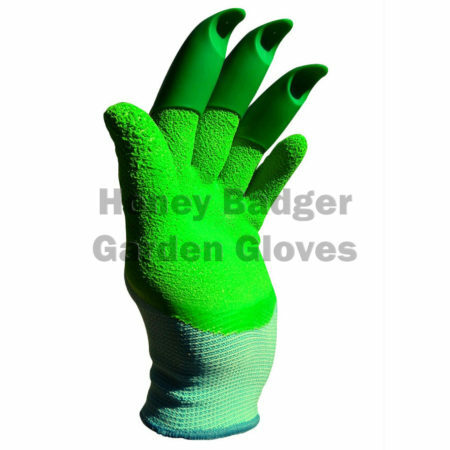 The Badger Garden Glove is NOT meant to replace any existing gardening tools. 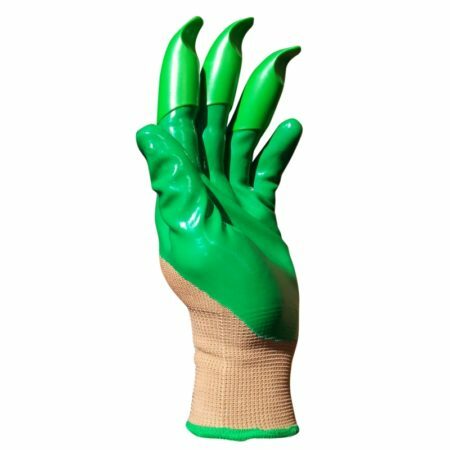 It is meant to be a supplementary tool that offers Superior Hand Protection, Superior Durabiliy and also has tooling features designed for light gardening tasks. Q: Are these gloves Eco – friendly? A: YES, the Honey Badger Gloves are designed to be sustainable in a couple of ways. 1/ They are tested & rated for up to 200 hours of average gardening use (the best selling common garden glove will have worn out fingertips within 10 to 15 hours of average gardening use). 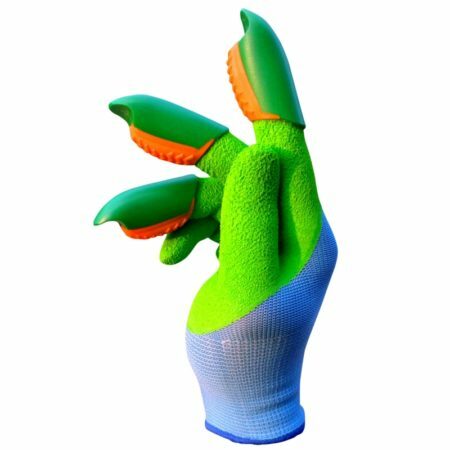 2/ The glue that is used to permanently attach the claws to the gloves is composed of LOW VOC (environmentally friendly adhesive). 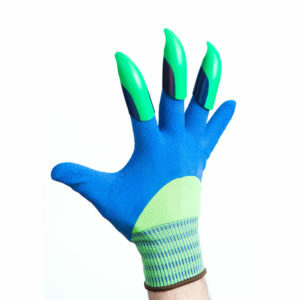 A: The glove is Blue & Green, – but to give some variation, we have claws that come in four colors. Q: What are the claws made of? A: The Claws are made of durable ABS plastic with added UV protection against cracking if left exposed to the sun. ABS is what LEGO’s are made of, and often used in the automotive industry. Q: What hand are the claws attached to? A: You can order the claws on either the Left, Right OR both hands. The glove itself is always a pair. Q: COST – Is it more expensive to order the claws on both hands? A: Yes. 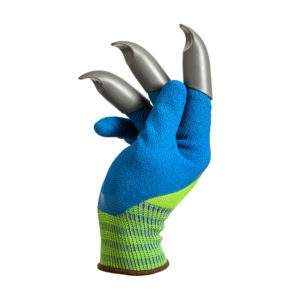 A pair of gloves with claws on ONE HAND only is $24.95. 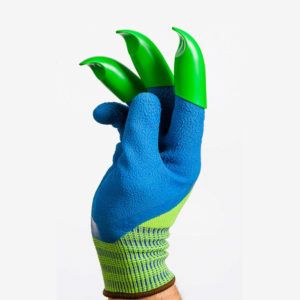 A pair of gloves with claws on BOTH hands is $29.95. Shipping is additional. A: Yes, we are currently offering: Family pack discounts ( 5 Pairs ), ( 10 pairs ) and Community packs ( 30 pairs ). For wholesale volumes please contact your local distributer or contact us. Q: Do you have Badger Gloves for Children? A: We are trying to bring it to market for next season. A: Like any similar product we’re offering a return and exchange upon inspection. If the product was faulty ( defective ) upon delivery we will exchange it for a new equivalent pair. A: Yes, please see our link in the footer of our home page. Q: How do I know WHICH SIZE TO ORDER ? A: These gloves are marked according to Men’s Sizes in the American Sizing Standards. Ladies should order one size smaller than they normally wear in the Women’s Sizing Standard. If you normally wear LADY’S LARGE then order MEDIUM ( and so on for the other sizes). Q: Is there a SIZING CHART available? A: YES, you will see a sizing chart available when selecting your item on the products page & also below. It uses the Imperial system ( inch units ).